RESETTING THE SOUL AND CREATIVE JUICES FOR THE ARTISTIC CHILD — The Eternal Child. As another year comes to a close - and a new beginning is at our fingertips, I am reminded that I am allowed to let go of the baggage I have accumulated over these past 365 days. This time between christmas and new years should be a time of rest and rejuvenation - a time to reflect and look inward, to feed our creative souls. However, with the expectation of family engagements and hosting - I tend to find almost no time for myself — leaving me completely exhausted and off track. I often find it hard to be creative come January. Maybe it’s that my body is tired and my mind needs a winter hibernation? Maybe it's that I'm simply bummed that the holidays are over and I no longer get to keep a fir tree in my home and sparkling lights around my house? Or maybe, its rooted in fear? Another year has ended, so it’s hard not to over analyze the list of failures or the list you just “didn't get to yet”. Whatever you may think it is - it most likely is a mixture of it all - a mental chaos that ultimately exhausts your body and consumes your creative juices. So … how do we NOT allow this to happen, yet again? I’m still figuring it out myself - but as I sit here, in the sun, by myself, simply breathing - it all somehow doesn’t seem so overwhelming. I have come to believe that mediation or if you prefer to call it “ that time spent getting lost in your own thoughts” is key to a healthy artists soul. The constant demand that society and even worse - our own selves - have placed on top of our shoulders to create something magical, at this rapid pace, is simply unrealistic. I constantly have to remind myself to practice the concept of grace, to give myself time and the inspiration will soon appear. 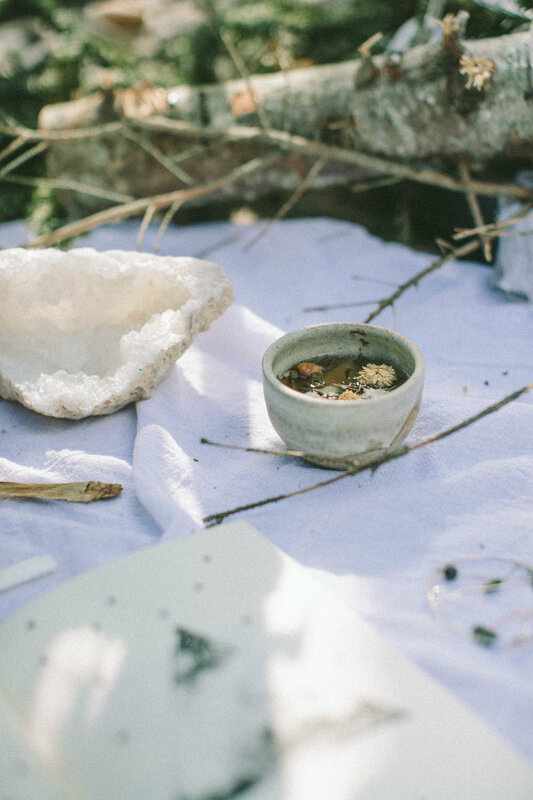 This is why I constantly surround myself with beautiful things, why I burn incense and palo santo nonstop, why I always drink out of the handmade ceramic that speaks to me that day, why fresh flowers are always welcome in my home and — if I choose to take time to cook, that it be with freshest ingredients and shared with the people around me. It’s these things that make my life full and also help get my creative juices flowing - even on dark winter days. If you take the time out of the busyness - to reflect inward and create beautiful moments for yourself - then you will be rewarded with inspiration. A lot of times, some of my best art directing and photography appears randomly out of what I chose to do that day. It wasn’t overly planned - it just naturally happened, because I was being present. I didn’t need to work hard to create it. So instead of getting in a funk this winter - I’m going to be more intentional and give myself some time and grace to reset for another year. I need to just remind myself to have patience - be present to the the new season and the creativity will appear. I have been spending my mornings surrounding myself with beauty - meditating and reading Guillaume Wolf’s You are a Circle and You are a Message. Both books are formulated as poems and meditations for the creative mind. They are merely reminders that everything I need is already within me. I just have to stimulate the right energies. So my creative children - I implore you take a rest - surround yourself with beauty - and know, that the creativity for this new year will arrive in due time. A lot of people ask me what a lifestyle company is - and it is simply this - my discoveries on how to live a healthy creative life- all the elements right here, pieced together by me and my community. Forage some vine, I used Passion Vine, as it is very easy to work with and grows in most wooded areas. De-leaf and soak in water over night. Wrap / braid into formation and let it dry. 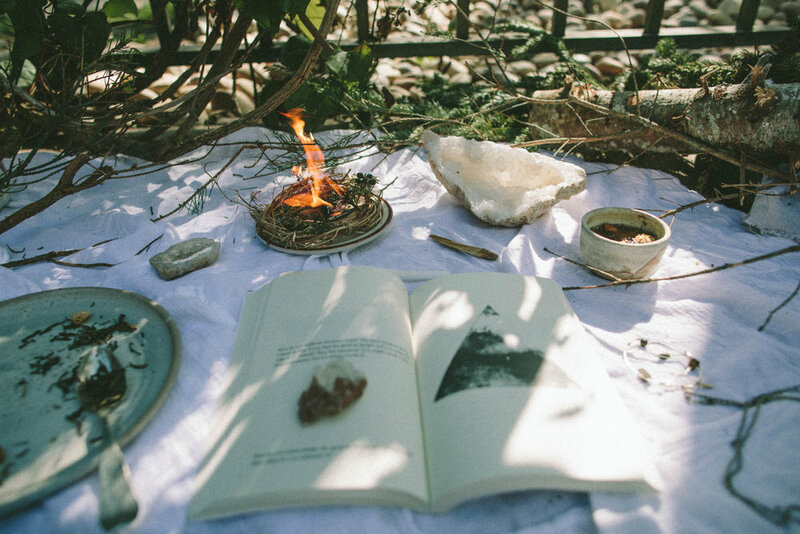 Next forage your favorite plants and wood pieces to burn. I chose balsam fir, juniper, cedar and palo santo. Now get creative and wrap in the leaves into the vine or simply make a bed for the wreath. Let the greens dry for a week before you burn it. A lot of times I place a votive candle in the center while I wait for it to dry. Make sure to build your burning wreath on a plate or stone that is durable for burning. You only need a few small pieces, as the more you use, the bigger the flames will get. I always create a hole in the middle for my palo santo. This allows you to light the wood and let the pieces catch naturally. You don't want it to burn out all at once, so be careful. I have been burning mine everyday, adding in new pieces of balsam and cedar - to help cleanse my soul for the new year. Let me know if you make one - send us some photos of your beautiful creations!